This article was published in the Spring 2017 Baseball Research Journal. Peter C. Bjarkman is the author of more than 40 books on sports history, including academic histories, coffee-table pictorials, and biographies for young adults. Best known as the leading authority on post-revolution Cuban League baseball, he has also helped to shape our understanding of the long, often difficult interaction between Latin American baseball and Major League Baseball. His 1994 book, Baseball with a Latin Beat, was followed in 2007 by the even more ambitious A History of Cuban Baseball, 1864–2006. Bjarkman has enjoyed a notable career in baseball but still has the enthusiasm and drive of a rookie. 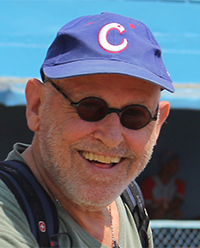 At 76 he has just published a typically erudite and pointed book, Cuba’s Baseball Defectors: The Inside Story, and he gives no sign of slowing down. In the works are The Baseball Biography of Fidel Castro and The Yanqui in Cuba’s Dugout: Travels Inside Fidel Castro’s Baseball Empire. Omar Minaya has said of him, “Nobody knows more about the intertwining of politics and baseball in Cuba than Peter Bjarkman.” He has had to wend a serpentine path between the two on his way to becoming the great expert on Cuban baseball yesterday and today. Though Peter is an outstanding researcher, his greatest feat has been to take his expertise from the archives to the dugouts and ballparks of Cuba today. Peter Bjarkman grew up in Hartford, Connecticut. After graduating from the University of Hartford — where he played varsity basketball and baseball — he stayed in town to teach high-school English. Going on to teach in Ecuador and Colombia, he became fluent in Spanish and went on to earn a doctorate in linguistics, with a specialty in Cuban Spanish. His collegiate teaching career included positions at George Mason, Butler, Ball State, the University of Colorado, and Purdue. He still resides in West Lafayette, Indiana, with his wife, Purdue University linguistics professor Ronnie B. Wilbur, a leading researcher and authority on deaf sign languages. But a siren song pulled Peter away from academia to baseball and a second, improbable career — that of baseball historian and writer for hire (much as happened to this writer once upon a time). Retiring from linguistics and its constant comparisons between cultures, he brought that unique perspective to baseball. In America everyone fancies himself a baseball expert; perhaps in Cuba too. But no American has joined the past, present, and future of each nation’s view of the game as Bjarkman has. Given the frigid political relations between Cuba and the US, it was no easy matter for him to combine with picture archivist Mark Rucker to seek the cooperation of the Castro government to produce a visual history of the Cuban game. The pair traveled to Cuba in the late 1990s and produced a beautiful book (designed by Todd Radom) that I was proud to publish with Total Sports Illustrated — Smoke: The Romance and Lore of Cuban Baseball. In the Wall Street Journal profile of Bjarkman in November 2010, he recalled that the Cuban government reception to the book was chilly because he had included images of two notable defectors. “We never would have put them in there if the publisher hadn’t requested it,” he told the WSJ. I had thrown a boulder in Peter’s path. But slowly Cubans passionate about the game began circulating the book and Peter returned to a state of cordial relations with Cuban officials. “Pete has to walk a tightrope to do that job,” Rucker observed. This has led some to say that his relationship with the Cuban government has been too cozy for their tastes. Yet his unique ability to tell the story of Cuban baseball without fear or favor has been the hallmark of his career, and what has brought him one of this year’s Chadwick Awards. Bjarkman has appeared frequently on radio and television sports talk shows as an observer and analyst of Cuban baseball. His articles appear in a wide range of publications. In a field of baseball research that will blossom with the expected reduction of tensions between our two baseball-loving nations, Peter Bjarkman has a unique contribution still to make, and a legacy that will inspire others to build upon his landmark body of work. Click here to learn more about the Henry Chadwick Award.